Lightning is complex, powerful and dangerous, but understanding its formation will help you observe it safely. Thunder and lightning. Without them there are no thunderstorms. And of course I've put them in the wrong order. When conditions are right it is the lightning which, by overcoming the huge insulating properties of the atmosphere, equalises positive and negative charges which have built up in the storm. This huge burst of energy instantly heats up the air, which expands extremely fast and creates a shock wave. The speed of the shock wave creates a sonic boom, and we hear thunder. But because light travels much faster than sound, we always see the lightning before we hear the thunder. But while lightning is characteristic of Thunderstorms, it can occur in any highly turbulent air mass with enough particles to generate electrostatic charges from friction when they come in contact with each other. So lightning has been observed in volcanic eruptions, in smoke clouds above very large fires, and in nuclear explosions. But in thunderstorms the charge results from contact between ice pellets and/or watery ice (called graupel) as the storm builds. It seems that some form of ice is necessary to produce the static electricity that causes the lightning, although in most storms the smaller pellets and hailstones will melt before we see them on the ground. Now although the basics of lightning formation and its passage from cloud to ground are relatively easy to understand, the details are still not entirely clear. This link will take you to an excellent, easy to read article on everything to do with Lightning. There is no doubt that an early evening thunderstorm is one of nature's best displays of the shock and awe of weather. When it's dark enough for the lightning to be clearly visible, but still light enough to see the outline of the storm clouds, there is no better spectacle, as the extreme weather photographers well know. But may I introduce my customary cautionary statement at this point? A spectacular lightning display is often associated with a severe storm, so all the normal precautions should be taken. In addition, please keep in mind the basic facts of lightning behaviour and risk. 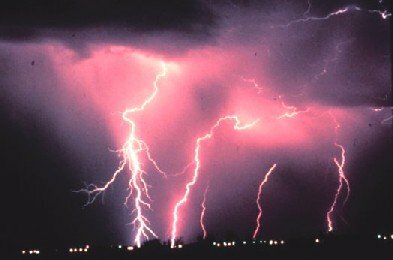 Lightning is the number two cause of weather related fatalities, second only to floods. On average lightning causes around 80 deaths per year in the USA, more than the combined total for hurricanes and tornadoes. Most of these deaths occur in advance or shortly after the peak phase of the storm, and non fatal injuries can be severe and long lasting. About 600 people are struck by lightning each year, and as might be expected the incidence of death and injury is related to the frequency of storms. Florida has the greatest storm frequency, but most southern states can expect frequent storms, particularly in spring and summer. Northwestern states have fewer thunderstorms and a much lower rate of lightning strikes. The basic lightning safety rules are simple. At the first sound of thunder move to the safest place. Enclosed buildings are best, hardtop cars are the next best option. If you are caught away from home or your vehicle, keep clear of tall trees and artificial structures. If caught in an open field, reduce your profile by crouching on the balls of your feet, and cover your ears against the noise of very close thunder. If you notice your hair standing on end and hear a buzzing sound, run! A strike is imminent in your very immediate area. All in all, your chances of being struck are very low, but still significant if you are caught in the open during a storm. If you see someone struck by lightning, give immediate first aid, including CPR if necessary. The injured person will not retain any electric charge - there is no danger to you in touching them, and their chances of successful recovery are much greater if assistance is given as quickly as possible. During a storm, updrafts and downdrafts create friction, particularly when ice pellets collide. The result is that the lower part of the cloud becomes negatively charged, while the upper part is positive. Relative to the lower part of the cloud, the ground in the immediate area develops a weak positive charge. The build up of static electricity is immense, and despite the atmosphere being a very good insulator, eventually the charge difference becomes great enough to overcome it. Balancing of positive and negative charges is achieved almost instantaneously by a giant spark in the form of lightning. This is not a one off event. The turbulence which promoted the development of the charge imbalance continues, and grows as the storm develops, so a sequence of repeated charge build up and equalisation through lightning discharge will continue during the storm. Because the pattern of storm formation is complex, the distribution of positively and negatively charged zones within the storm system is also complex, and the situation changes minute by minute. Lightning will travel wherever necessary to restore equilibrium - within the cloud, from cloud to cloud, from cloud to air, or from cloud to ground. The last one is the least common, but cloud to ground strikes have the greatest effects on life and property. The physics of a cloud to ground strike are not completely understood, but one surprising thing about a lightning strike is that the bright strike that we see is a massive current flow upwards from earth to cloud, after a visually insignificant first contact by a leader from cloud to ground. This happens so fast that the human eye sees it differently, as if the bright lightning bolt has travelled downward from the cloud. Most of these negative lightning strikes, so called because they originate in the negatively charged lower part of the cloud, reach the ground fairly close to the core of the storm. But what happens in the upper, positively charged zone? Although much rarer, lightning strikes originating from within the upper part of the cloud, as high as 30-40,000 feet (10-13,000 metres or more, form a significant proportion of all lightning. They are much more dangerous than the negative lightning from near the cloud base for several reasons. Firstly they have to overcome a much greater thickness of insulating air to reach the ground, and consequently they are much more powerful - about ten times stronger than a negative strike at 1,000,000 volts, with a longer flash duration. Secondly their strike zone can extend well away from the storm center. Their path can be erratic and they are capable of striking more than 10 miles (16km) from the storm. At that distance, thunder from the main body of the storm may not be audible, so these classic "bolts from the blue" can arrive without any warning. Positive lightning is also believed to be responsible for many large strikes that occur well after the center of the storm has passed. This combination of great power and unexpected arrival makes positive lightning very dangerous. Positive lightning is also thought to be responsible for many forest fires, and a large proportion of power line damage. Due to the large distances the lightning can travel, it may strike outside the storm path, so no rain follows the strike to extinguish the fire. Bipolar lightning, which changes its polarity from positive to negative, is also known, but I think I'll leave that to the experts. 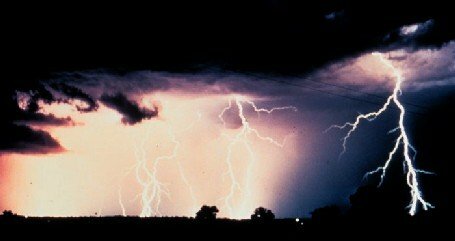 The normal home weather station does not record lightning, and indeed could be at risk from it. If you have a roof mounted system, a properly installed, substantial wire to earth is essential. Otherwise, when severe lightning is expected it may be worth disconnecting your system while the risk is high. It would certainly be prudent to disconnect any wiring from a cable system, as it would be likely to provide a path for the lightning into your home if struck. However there are other ways of monitoring lightning. I guess we're all familiar with the static affecting AM radio when lightning is in the area - it is often the first guide to an approaching storm. Work up that effect a little more and you have yourself a lightning detector. 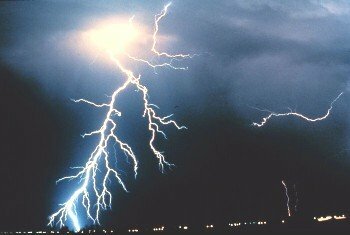 Commercially produced detectors can range from fairly basic units which let you know when a storm is approaching, to some elegant computer linked devices which plot the location of lightning strikes on a map Lightning Detectors are the subject of another article. Here's the place to go if you are looking for More Lightning Resources. This link will take you back to the Top, or, when you're ready, here's how to return to the Home page. You may be interested to know that you can find out more about weather and home weather stations by receiving our newsletter ,"Watching Weather". It's published more or less weekly, and apart from tips on how to use your weather station and understand what it's telling you about the weather around you, it also covers many other weather related topics. If this sounds interesting, just add your name and email address to the form below. When you join, you'll also receive, totally free, a 20 page guide to setting up and trouble shooting problems in home weather stations. And I promise that you won't get spammed, and that your sign up details will remain totally confidential. Sign up now and receive your first issue almost immediately. *Product links and pricing. The products I mention are, in my opinion, the best of the range in each category.But this doesn't mean they are just what you are lookingfor, and it is always worth following the link to the manufacturer's page. But don't buy from there - in almost all cases muchbetter prices are available from both shopfront and internetbased retailers. At all times eBay and Amazon are worthchecking out, and you will notice many of the links go toAmazon. Amazon has built a very sound reputation for customerservice, given the huge amount of business that passes throughtheir website, and many products are accompanied by cleardescriptions, alternatives, and reviews from customers. Thesecan be very helpful, and I shop at Amazon myself. But prices can change very quickly there, so if you have madeup your mind on a product and you see a good price there, grab it before it goes. Where possible, I provide links to other retailers where their prices are competitive. Some may be better than they seem ifthe prices include delivery and, where needed, batteries - check the terms they offer. Finally, I stand to make small commissions on some of the productsI recommend. A lot of work goes into building and maintaining asite like this, and I am not ashamed if I recoup some of the costs,and even make a little money on top. That being said, I will and do recommend sellers where I will notmake anything for myself. One of these is Ambient Weather, a useful retail site with good supporting information. But if you visit there, don't forget to come back!